This article is about the Atlantic hurricane of 2004. For other storms of the same name, see Hurricane Charley (disambiguation). 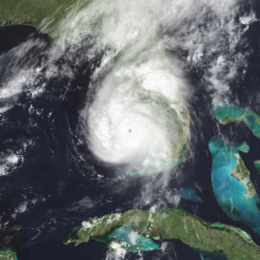 Hurricane Charley was the first of four individual hurricanes to impact or strike Florida during 2004, along with Frances, Ivan and Jeanne, as well as one of the strongest hurricanes ever to strike the United States. It was the third named storm, the second hurricane, and the second major hurricane of the 2004 Atlantic hurricane season. Charley lasted from August 9 to 15, and at its peak intensity it attained 150 mph (240 km/h) winds, making it a strong Category 4 hurricane on the Saffir-Simpson Hurricane Scale. It made landfall in Southwest Florida at maximum strength, making it the strongest hurricane to hit the United States since Hurricane Andrew struck Florida in 1992 and the strongest hurricane to hit southwest Florida since Hurricane Donna in 1960. After moving slowly through the Caribbean Sea, Charley crossed Cuba on Friday, August 13 as a Category 3 hurricane, causing heavy damage and four deaths. That same day, it crossed over the Dry Tortugas, just 22 hours after Tropical Storm Bonnie had struck northwestern Florida. It was the first time in history that two tropical cyclones struck the same state in a 24-hour period. At its peak intensity of 150 mph (240 km/h), Hurricane Charley struck the northern tip of Captiva Island and the southern tip of North Captiva Island, before crossing over Bokeelia causing severe damage. Charley then continued to produce severe damage as it made landfall on the peninsula in Punta Gorda. It continued to the north-northeast along the Peace River corridor, devastating Punta Gorda, Port Charlotte, Cleveland, Fort Ogden, Nocatee, Arcadia, Zolfo Springs, Sebring, and Wauchula. Zolfo Springs was isolated for nearly two days as masses of large trees, power poles, power lines, transformers, and debris filled the streets. Wauchula sustained gusts to 147 mph (237 km/h); buildings in the downtown areas caved onto Main Street. Ultimately, the storm passed through the central and eastern parts of the Orlando metropolitan area, still carrying winds gusting up to 106 mph (171 km/h). The city of Winter Park, north of Orlando, also sustained considerable damage since its many old, large oak trees had not experienced high winds. Falling trees tore down power utilities and smashed cars, and their huge roots lifted underground water and sewer utilities. The storm slowed as it exited the state over Ormond Beach just north of Daytona Beach. The storm was ultimately absorbed by a front in the Atlantic Ocean shortly after sunrise on August 15, near southeastern Massachusetts. Charley was initially expected to hit further north in Tampa, and caught many Floridians off-guard due to a sudden change in the storm's track as it approached the state. Along its path, Charley caused 10 deaths and $16.9 billion in damage to insured residential property, making it the second costliest hurricane in United States history at the time. Charley was a compact, fast-moving storm, which limited the scope and severity of the damage. Charley began as a tropical wave that moved off the west coast of Africa on August 4. It moved quickly westward and steadily organized over the open Atlantic Ocean, with convection developing in curved bands. The wave continued to develop as it approached the Lesser Antilles, and became Tropical Depression Three on August 9 while 115 mi (185 km) south-southeast of Barbados, near the island of Grenada, however, the threat to Barbados was short-lived. Low upper-level wind shear and well-defined outflow contributed to further intensification, and the depression strengthened on August 10, despite being located in the eastern Caribbean Sea, which is an area not particularly suited to tropical cyclogenesis. At this time, the National Hurricane Center in Miami designated the name "Charley." A strong ridge of high pressure to the system's north forced Charley to change track quickly to the west-northwest. It continued to strengthen and became a Category 1 hurricane on August 11, while 90 mi (140 km) south of Kingston, Jamaica. The storm was being steered around the periphery of the high pressure area, and as a result, Charley changed direction toward the northwest. The following day, the core passed 40 mi (64 km) southwest of Jamaica, affecting the island on August 11 and 12. The storm then passed 15 mi (24 km) northeast of Grand Cayman, reaching Category 2 status just after passing the island. The hurricane continued to strengthen as it turned to the northwest and rounded the southwest portion of the subtropical ridge, becoming a major hurricane—a storm classified as a Category 3 hurricane or higher—just before making landfall on southern Cuba. Charley came ashore near Punta Cayamas with maximum sustained winds of 120 mph (190 km/h) and gusts of up to 133 mph (214 km/h), at about 0430 UTC on August 13. It weakened while crossing the island, passing about 15 mi (24 km) west of downtown Havana before weakening to 110 mph (180 km/h). After crossing Cuba near Menelao Mora, Hurricane Charley accelerated to the north-northeast, toward the southwest coast of Florida in response to the approach of an unseasonal mid-tropospheric trough. Charley passed over the Dry Tortugas at 1200 UTC on August 13, with maximum winds of about 110 mph (180 km/h). The strike occurred only 22 hours after Tropical Storm Bonnie made landfall on St. Vincent Island, marking the first time two tropical cyclones hit the same state within a 24-hour period. Then Charley rapidly intensified, strengthening from a 110 mph (180 km/h) hurricane with a minimum central barometric pressure of 965 mbar (hPa; 28.50 inHg) to a 145 mph (233 km/h) hurricane with a pressure of 947 mbar (hPa; 27.96 inHg) in just three hours. It continued to strengthen as it turned more to the northeast, and made landfall near the island of Cayo Costa, Florida as a 150 mph (240 km/h) Category 4 hurricane with a pressure of 941 mbar (hPa; 27.79 inHg) at approximately 1945 UTC on August 13. An hour later, the hurricane struck Punta Gorda as a 145 mph (233 km/h) storm and then passed up through Port Charlotte. However, the eye had shrunk before landfall, limiting the most powerful winds to an area within 7 mi (11 km) of the center. Charley weakened considerably due to its passage over land, but still retained sustained winds of about 85 mph (137 km/h) as it passed directly over Orlando between 0020 and 0140 UTC August 14; gusts of up to 106 mph (171 km/h) were recorded at Orlando International Airport. It cut a swath of destruction across Florida, also passing near Kissimmee. The hurricane reemerged into the Atlantic Ocean after crossing directly over New Smyrna Beach as a Category 1 hurricane, but restrengthened slightly over open waters. Continuing to move rapidly to the north-northeast, Charley struck near Cape Romain National Wildlife Refuge, South Carolina as an 80 mph (130 km/h) hurricane, moved offshore briefly, and made its final landfall near North Myrtle Beach as a minimal hurricane, with winds of 75 mph (121 km/h). Charley then began interacting with an approaching frontal boundary, becoming a tropical storm over southeastern North Carolina. After moving back into the Atlantic Ocean near Virginia Beach on August 15, the storm became extratropical and became embedded in the frontal zone. The extratropical storm continued to move rapidly to the northeast, and was completely absorbed by the front shortly after sunrise on August 15, near southeastern Massachusetts. NEXRAD image of Hurricane Charley over Punta Gorda, Florida just after landfall. On August 10, two days before the hurricane passed near the island, Jamaican officials issued a tropical storm warning, which was upgraded to a hurricane warning a day later. In Jamaica, the threat of the storm forced the country's two airports to close, and also forced two cruise ships to reroute. The Cayman Islands issued a hurricane warning on August 11, a day before the hurricane passed near the archipelago. Cuban government officials issued a hurricane watch for the southern coastline on August 11, two days before the hurricane struck the island. This was upgraded to a hurricane warning on the 12th, 13 ½ hours before Charley made landfall. Because of the threat, the government issued a mandatory evacuation for 235,000 citizens and 159,000 animals in the area of the expected impact. An additional 3,800 residents were evacuated from offshore islands, while 47,000 in Havana were transported from old, unsafe buildings to safer areas. The people were transported to shelters provisioned with supplies. In addition, the power grid in southern Cuba was turned off to avoid accidents. On August 11, Florida governor Jeb Bush issued a state of emergency declaration due to the impending threat Charley presented to the state while the storm was still located south of Jamaica. The National Hurricane Center issued hurricane warnings for the Florida Keys and from Cape Sable to the mouth of the Suwannee River a day prior to Charley's passage through the state, while tropical storm warnings were issued elsewhere throughout Florida. Because of the threat, 1.9 million people along the Florida west coast were urged to evacuate, including 380,000 residents in the Tampa Bay area, and 11,000 in the Florida Keys. It was the largest evacuation order for Pinellas County history, and the largest evacuation request in Florida since Hurricane Floyd five years before. Many Floridians remained despite the evacuation order, as authorities estimated that up to a million people would not go to shelters; instead, these residents boarded up their homes and bought supplies to ride out the storm. However, about 1.42 million people evacuated their homes in Florida, and approximately 50,000 residents were placed in shelters throughout the state. Power companies mobilized workers to prepare for the expected widespread power outages. MacDill Air Force Base, home of U.S. Central Command (USCENTCOM) and the U.S. military center for the Iraq War, severely limited its staff on base, shifting most of its operations to its forward headquarters in Doha, Qatar. Similarly, Kennedy Space Center, which usually counts with 13,000 on-site personnel, reduced its staff to only 200 people in preparation for the hurricane, and secured all Space Shuttles by sealing them in their hangars. Many amusement parks in the Orlando area closed early, and Walt Disney World's Animal Kingdom remained closed. This was only the second time in history that a Disney park was closed due to a hurricane, with the other occurrence being after Hurricane Floyd. The approaching hurricane also forced several cruise ships to reroute their paths, and forced rail service between Miami and New York to shut down. Charley making landfall on August 13, 2004. The rapid strengthening of Charley in the eastern Gulf of Mexico caught many by surprise. Around five hours before its Florida landfall, Charley was a strong Category 2 hurricane predicted to strengthen its strongest winds to 115 mph (185 km/h) upon its landfall in the Tampa-Saint Petersburg area. About two hours before landfall, the National Hurricane Center issued a special advisory, notifying the public that Charley had become a 145 mph (233 km/h) Category 4 hurricane, with a predicted landfall location in the Port Charlotte area. As a result of this change in forecast, numerous people in the Charlotte County area were unprepared for the hurricane, despite the fact that the new track prediction was well within the previous forecast's margin of error. National Hurricane Center forecasting intern Robbie Berg publicly blamed the media for misleading residents into believing that a Tampa landfall was inevitable. In addition, he also stated that residents of Port Charlotte had ample warning, as a hurricane warning had been issued for the landfall area 23 hours before, and a hurricane watch had existed for 35 hours. Several local meteorologists, however, did depart from the official predictions of a Tampa Bay landfall as early as the morning of August 13. Jim Farrell of WINK, Robert Van Winkle WBBH, Steve Jerve of WFLA in Tampa, Jim Reif of WZVN in Fort Myers, and Tom Terry of WFTV in Orlando, all broke with their national news forecasts and stated at around 1500 UTC that Charley was going to turn early, striking around Charlotte Harbor and traveling over Orlando, as would prove to be the case. Following the Florida landfall, Georgia Governor Sonny Perdue declared a state of emergency as a precaution against a 4–7 ft (1.2–2.1 m) storm surge and price gouging. In South Carolina, Governor Mark Sanford declared a state of emergency as Charley approached its final landfall. Two coastal counties were forced to evacuate, with state troopers redirecting traffic further inland from Myrtle Beach. In all, 138,000 evacuated from the Grand Strand area. One death in Jamaica, four deaths in Cuba, and ten deaths in the United States were directly attributed to Charley. Numerous injuries were reported, as well as 25 indirect deaths in the U.S.
Property damage from Charley in the United States was estimated by the NHC to be $16 billion. At the time, this figure made Charley the second costliest hurricane in United States history, behind 1992's Hurricane Andrew's $27.3 billion. On Jamaica, strong winds caused moderate damage to the agricultural sector, with crop and livestock damage totaling to $1.44 million. As the storm traveled along the southwest coast of Jamaica, it caused heavy wind and rain damage. Damage was heaviest in Saint Elizabeth Parish, where 100 people had to be housed in six shelters. Strong winds downed trees and power lines, causing power outages and blocking roads. Throughout the country, Charley caused $4.1 million in damage and one fatality. In spite of the close approach that Charley made on the Cayman Islands, the islands were mostly spared, and were subjected to little damage. Rainfall was light, peaking at 0.9 inches (23 mm) in Grand Cayman, while Cayman Brac reported tropical storm force winds. Operationally, forecasters estimated that Charley struck southern Cuba as a 105 mph (169 km/h) Category 2 hurricane on the Saffir-Simpson scale. In post-hurricane-season analysis, Charley was determined to have struck southern Cuba as a 120 mph (190 km/h) hurricane; the original estimate was revised based on a report of a 118 mph (190 km/h) sustained wind measurement in Playa Baracoa, and meant that Charley was a major hurricane at landfall. The hurricane produced a storm surge of up to 13.1 ft (4.0 m) in Playa Cajio; on the other hand, Charley's quick passage caused precipitation amounts to be small, with the largest total, 5.87 inches (149 mm) occurring in Mariel. Strong wind gusts downed nearly 1,500 power lines and knocked over 28 large high tension wire towers at a power plant in Mariel. As a result, more than half of the electricity customers in Havana Province were left without power for 12 days after the storm, and all of Pinar del Río Province was without power for over 11 days. Blackouts continued in areas where power returned. The power outages resulted in lack of drinking water for numerous people, including no potable water in the city of Havana for four days. As a result, the Cuban government sent water tanks to satisfy the short term need. Similarly, there was a lack of gas for cooking for over a week. However, one Cuban government official stated that it could take up to two months for basic utilities to be returned to many isolated villages. Near its landfall location, Charley destroyed 290 of the 300 houses in the village, while over 70,000 homes in Havana were either damaged or destroyed. Numerous hotels reported damage, potentially impacting the important tourism industry in the country. Agricultural damage was heavy, with the hurricane damaging more than 3,000 agricultural institutions. Citrus officials estimated a loss of 15,000 metric tons of grapefruit on the Isle of Youth, while strong winds ruined 66,000 metric tons of citrus trees in the Havana area. Charley also destroyed around 57,000 acres (230 km²) of fruit trees in the Havana area. Approximately 95% of the sugar cane, bean, and banana crops were affected in Cuban territory. In all, Charley was directly responsible for four deaths in Cuba, and was responsible for $923 million in property damage, primarily from agricultural losses. Hurricane Charley severely affected the state of Florida. There were nine direct fatalities, 20 indirect fatalities, and numerous injuries attributed to the storm. Property damage was estimated at $5.4 billion, and approximately $285 million in agricultural damage. However, due to Charley's speed (it crossed the Florida peninsula in approximately seven hours) and small size, rainfall along the eyewall was mostly limited to 4–6 inches (10–15 centimetres). While moving northward to the west of the Florida Keys, Charley produced moderate winds of 48 mph (77 km/h) with gusts to 60 mph (97 km/h) in Key West. The winds toppled a few trees, power lines, and unreinforced signs. A boat, knocked loose by strong waves, struck a power transmission line, causing widespread power outages from Marathon to Key West. On Fort Jefferson in the Dry Tortugas, the hurricane produced an estimated storm surge of up to 6 ft (1.8 m). The surge, combined with incoming waves, caused extensive flooding in the park and damaged numerous docks. In spite of this, property damage was minimal in the area, totaling $160,000. Hurricane Charley passed directly over Captiva Island near Cayo Costa with peak winds of 150 mph (240 km/h). The Category 4 hurricane produced an estimated storm surge of up to 6.5 ft (2.0 m) on the island, which is lower than expected for a storm of its intensity. The decrease in the height of the surge was due to the hurricane's small size and its rapid intensification just prior to landfall. Furthermore, the storm surge, combined with the strong pressure gradient, produced a 450-meter-wide (0.28 mi) inlet on North Captiva Island, known as Charley's Cut. Strong waves and storm surge caused severe beach erosion and dune damage at various locations. The storm severely damaged five houses, lightly damaged many others, and downed many trees on Gasparilla Island. At least half of the 300 homes on North Captiva Island were substantially damaged, including ten that were destroyed. On Captiva Island, the strong winds severely damaged most houses, as well as several recreational buildings. The city of Arcadia in DeSoto County saw extreme damage, in spite of being relatively further inland. About 95% of the buildings in the downtown area saw some sort of damage. The only shelter in the town had its roof torn open by the wind, leaving 3,500 evacuees inside unprotected from the onslaught of the storm. Damage caused to a gas station by Hurricane Charley in Kissimmee, Florida. Hardee County saw property damage estimated at $750 million, along with six injuries, but no deaths were reported. Charley caused blackouts in the entire county, as well as damage to 3,600 homes and the destruction of 1,400. A radio tower near Sebring was toppled, along with numerous trees and power poles along the north and east side of Highlands County. Additionally, there were several reports of severely damaged homes in Polk County near Babson Park and Avon Park. In Lake Wales, Florida, a sand mine lake encroached into State Road 60 due to wave action and swallowed a car. Additionally, Lake Wales saw 23,000 buildings damaged, as well as the destruction of 739 structures. Seven deaths were reported in the county, one of them determined to be direct. Throughout the rest of the islands in Sarasota, Charlotte, Lee, and Collier counties, strong winds from Hurricane Charley caused severe damage to hundreds of buildings and trees. Lee County also endured an 8-foot (2.4 m) storm surge. These counties were exposed to Charley's eyewall, so they saw the most damage. Due to its small size, the area of most intense damage was located within a 10-mi (16-km) band centered on Charley's track, with additional heavy damage forming an outer band extending 7.5 mi (12.1 km) to each side of the inner swath of damage. In Charlotte County, 80% of buildings were damaged. President George W. Bush, aboard Marine One, surveys hurricane damage at a mobile home park in Fort Myers, Florida. On mainland Florida, Charley produced a peak storm surge of 10–13 feet (3.0–4.0 metres) at Vanderbilt Beach near Naples, along with a much lower surge at its Punta Gorda landfall. The hurricane dropped generally light rainfall across Florida, with the maximum amount of 9.88 inches (251 mm) occurring in Bud Slough in Sarasota County. In Punta Gorda's airport, where the hurricane made landfall, wind speeds of up to 90 mph (140 km/h) were measured, alongside gusts of up to 111 mph (179 km/h), before the instrument was blown apart, along with most of the planes and the airport itself. The Charlotte Regional Medical Center recorded an unofficial peak wind gust of 172 mph (277 km/h). Port Charlotte's Saint Joseph's Hospital had its roof blown away by Charley's strong winds. Due to the compact nature of the hurricane, the storm's radius of maximum sustained winds only extended a short distance from its center. In comparison, Fort Myers, which is only 25 mi (40 km) from where Charley made landfall, experienced sustained winds of only 61 mph (98 km/h) with gusts of 78 mph (126 km/h). In South Florida, Charley spawned several tornadoes, including a long-lived F2 that struck Clewiston, and five weak tornadoes near the point where the hurricane made landfall. The most severe damage from Hurricane Charley occurred in Charlotte County. In Boca Grande, numerous houses sustained extensive roof damage, while thousands of trees and power lines were uprooted or snapped. In Port Charlotte and Punta Gorda, many buildings, RVs, and mobile homes were completely destroyed, while other buildings were uproofed due to the powerful winds. Charley devastated Southwest Florida, causing $14.6 billion in property damage on the peninsula of Florida alone. Many towns such as Punta Gorda and Port Charlotte were leveled by the hurricane. Trees were downed and trailer parks were obliterated as far as Ormond Beach. Charley also caused considerable damage in the central and eastern parts of the state. Several possible tornadoes occurred, with severe thunderstorms during the duration of the storm. Winds were estimated to be at 80 mph (130 km/h) sustained near, and to the north of Okeechobee, while winds at Orlando International Airport topped out at 105 mph (169 km/h) in a gust. The storm caused 2 million customers to lose electricity in Florida. In some areas, power was not restored for weeks: 136,000 residents had no electricity a week after Charley's landfall, and 22,000 customers, primarily from cooperatives, were still waiting for their service to be restored on August 26. Citizens in Daytona Beach, New Smyrna Beach, and Port Orange in Southeastern Volusia County also dealt with storm surge from the St. Johns River and Halifax River, and Intracoastal Waterway as Charley passed over before re-emerging into the Atlantic Ocean. Further inland, Seminole County experienced some of the highest winds ever recorded from a hurricane in the area, with a gust of 97 mph (156 km/h) in Longwood at 0407 UTC on August 14 and 101 mph (163 km/h) in Altamonte Springs. Power was out in these areas for up to 12 days after the storm in some locations. Public schools in some counties in the path of the hurricane were scheduled to be closed for two weeks. In some areas this was necessary because the school buildings were damaged or destroyed: all 59 of Osceola County's schools were damaged, and one-third of Charlotte County's were destroyed by Charley's impact. DeSoto County schools saw $6 million in damage, while Orange County Public Schools saw $9 million in damage to their educational infrastructure. Agricultural losses were heavy. In Florida, the second-largest producer of oranges in the world, damage to the citrus crop was estimated at $200 million, and caused a 50% increase in the price of grapefruit juice. Charley, along with the other storms that hit Florida during 2004, caused a total agricultural loss of $2.2 billion. Other crops, nurseries, buildings, and agricultural equipment also suffered. Upon making landfall on northeastern South Carolina, Charley produced a storm tide that was unofficially measured to up to 7.19 ft (2.19 m) in Myrtle Beach. Wind gusts were moderate, peaking at 60 mph (97 km/h) in North Myrtle Beach, though there were several unofficial records of hurricane-force gusts. Charley produced moderate rainfall along its path, peaking at over 7 in (178 mm). Moderate winds knocked down numerous trees. Flash flooding occurred in Charleston County, causing drainage problems. Damage in South Carolina totaled to $20 million. In North Carolina, Charley produced an estimated storm surge of 2–3 ft (0.61–0.91 m), along with waves of up to 8 ft (2.4 m) in height. This produced minor beach erosion along the coastline. Winds gusted from 60 to 70 mph (97 to 113 km/h), causing minor wind damage. Rainfall amounts in the state were moderate, ranging from 4 to 6 in (100 to 150 mm), but still caused flooding across seven North Carolina counties. The hurricane spawned five weak tornadoes across the state, including an F1 in Nags Head that damaged twenty structures. Charley destroyed 40 houses and damaged 2,231, 231 severely, including 221 damaged beach homes in Sunset Beach. Damage was the greatest in Brunswick County, where wind gusts peaked at 85 mph (137 km/h). Crop damage was also heavy in Brunswick County, with 50% of the tobacco crop lost and 30% of the corn and vegetable fields destroyed. Strong winds downed trees and power lines, leaving 65,000 without power. Damage in North Carolina totaled to $25 million. Tropical Storm Charley produced wind gusts of up to 72 mph (116 km/h) at Chesapeake Light in Virginia, causing scattered power outages. Rainfall was light, ranging from 2 to 3.7 in (51 to 94 mm). Charley produced one tornado in Chesapeake and one in Virginia Beach. In Rhode Island, one man drowned in a rip current. ...the job of the federal government and the state government is to surge resources as quickly as possible to disaster areas. And that's exactly what's happening now. We choppered over and saw the devastation of this area. A lot of people's lives are turned upside down. We've got ice and water moving in, trailers for people...are moving in. The state is providing security...There's a lot of compassion moving in the area, the Red Cross is here. U.S. Health and Human Services Secretary Tommy Thompson released $11 million in additional aid and other assistance to Florida, with $10 million to be earmarked to Head Start facilities that need repair or new supplies, another $1 million was provided to the DeSoto Memorial Hospital in Arcadia and Osceola Regional Medical Center in Kissimmee, and $200,000 would be spent to provide services to senior citizens. Across Florida, 114 food service operations and eight comfort stations were set up. FEMA opened four disaster recovery centers. Because of its effects in the United States, the name Charley was retired from the rotating lists of tropical cyclone names in the spring of 2005 by the World Meteorological Organization. As a result, the name will never again be used for a North Atlantic hurricane. The name was replaced with Colin for the 2010 Atlantic hurricane season. ^ a b David Royse (2004). "How Rare is Tropical Storm Double Trouble?". Associated Press. Retrieved May 18, 2006. ^ "Hurricane Charley: A look back – pineisland-eagle.com, news, sports, Florida info, Pine Island Eagle". www.pineisland-eagle.com. ^ a b c d e f g h i j k l m n o p q r s t u v w x y z aa ab ac ad ae af ag ah ai aj National Hurricane Center (2004). "Hurricane Charley Tropical Cyclone Report" (PDF). Retrieved May 22, 2015. ^ a b c d e f g h i j k l m n Hydrometeorological Prediction Center (2006). "Hurricane Charley – August 12–15, 2004". Retrieved August 13, 2011. ^ Agence France Presse (August 17, 2004). "Rescuers sift debris from Hurricane Charley". The Sydney Morning Herald. Retrieved August 27, 2017. ^ a b c d e f g h i j k World Meteorological Organization (2005). "Twenty-seventh Hurricane Committee" (PDF). Archived from the original (PDF) on October 25, 2007. Retrieved June 3, 2006. ^ Florida State Emergency Management (2004). "Hurricane Charley report". Archived from the original on September 28, 2007. Retrieved August 13, 2007. ^ John Myers, Jr.; Janet Silvera (2004). "Jamaica spared — Charley brushes past southern coast heading for the Caymans". Jamaica Gleaner. Archived from the original on January 7, 2009. Retrieved June 3, 2006. ^ a b unknown (2004). "When a hurricane threatens, Cuba mobilizes". Retrieved June 1, 2006. ^ a b c William A. Messina (2004). "An Assessment of Hurricane Charley's Impact on Cuba". University of Florida. Retrieved June 4, 2006. ^ Florida State Emergency Response Team (August 11, 2004). "Situation Report 1: Tropical Storm CHARLEY" (PDF). Retrieved October 10, 2007. ^ a b National Climatic Data Center (2004). "Event Report for the Florida Keys". ^ a b c d CBS News (August 13, 2004). "2 Million Urged To Flee Charley". Retrieved June 1, 2006. ^ a b CBS News (August 12, 2004). "Tampa Bay Evacuation Ordered". Retrieved June 1, 2006. ^ Jim Teeple (August 13, 2004). "Hurricane Charley Forces Mass Evacuation in Florida". Voice of America. Archived from the original on May 22, 2011. Retrieved October 11, 2007. ^ Florida State Emergency Response Team (August 14, 2004). "Situation Report 7: Hurricane CHARLEY" (PDF). Retrieved October 10, 2007. ^ a b c d "NOAA Event Record Details". Archived from the original on May 19, 2011. Retrieved December 6, 2007. ^ a b CBS.com (August 14, 2004). "Hurricane Charley Comes Ashore". CBS News. Retrieved June 1, 2006. ^ Shaila K. Dewan; Ariel Hart; Lynn Waddell; Abby Goodnough (August 14, 2007). "Hurricane CHARLEY: The overview; Hurricane Rips Path of Damage Across Florida". The New York Times. Retrieved October 10, 2007. ^ Lawrence (2004). "Hurricane Charley Discussion Number 17". Retrieved June 1, 2006. ^ Lawrence (2004). "Hurricane Charley Discussion Number 18". Retrieved June 1, 2006. ^ Associated Press (August 14, 2004). "Charley's Force Tricks Experts". Wired. Retrieved June 2, 2006. ^ "WINK broadcast August 13, 2004". YouTube. Retrieved October 4, 2014. ^ Claudia Kienzle (2004). "Going With Their Gut". Archived from the original on August 16, 2006. Retrieved August 3, 2006. ^ Staff writer (August 13, 2004). "Hurricane Charley Update". Associated Press. Archived from the original on May 6, 2006. Retrieved October 10, 2007. ^ National Climatic Data Center (2004). "Event Report for South Carolina". Archived from the original on May 20, 2011. Retrieved June 23, 2006. ^ Eric S. Blake; Jerry D. Jarrell; Max Mayfield; Edward N. Rappaport; Christopher W. Landsea (July 28, 2005). "Costliest U.S. Hurricanes 1900–2004 (adjusted)". NOAA Technical Memorandum NWS TPC-1: The Deadliest, Costliest, and Most Intense United States Tropical Cyclones from 1851 to 2004 (And Other Frequently Requested Hurricane Facts). National Hurricane Center. Retrieved October 10, 2007. ^ a b International Federation of Red Cross and Red Crescent (2004). "Jamaica, Cuba, Cayman Islands:Hurricane" (PDF). Retrieved June 3, 2006. ^ Jack Beven (2004). "Hurricane Charley Public Advisory number 15". Retrieved June 1, 2006. ^ International Federation of Red Cross And Red Crescent Societies (IFRC) (January 18, 2006). "Cuba: Hurricane Charley Appeal No. 20/04 Final Report". ReliefWeb. Retrieved October 10, 2007. ^ "Atlantic hurricane best track (HURDAT version 2)". Hurricane Research Division (Database). National Hurricane Center. May 1, 2018. Retrieved April 22, 2019. ^ National Hurricane Center; Hurricane Research Division; Atlantic Oceanographic and Meteorological Laboratory (May 2018). "Continental United States Hurricanes (Detailed Description)". AOML. Miami, Florida: United States National Oceanic and Atmospheric Administration's Office of Oceanic & Atmospheric Research. Retrieved April 22, 2019. ^ a b Weisburg & Zheng (2005). "A Simulation of the Hurricane Charley Storm Surge and its Breach of North Captiva Island" (PDF). College of Marine Science, University of South Florida. Retrieved August 3, 2006. ^ a b Florida Department of Environmental Protection (2004). "Hurricane Charley: Post-Beach Conditions" (PDF). Archived from the original (PDF) on June 30, 2006. Retrieved August 3, 2006. ^ Tom Bayles (August 14, 2004). "Arcadia 'looks like a war zone'". Sarasota Herald-Tribune. Retrieved August 13, 2011. ^ REPORT, STAFF. "Arcadia still in a state of shock". ^ National Climatic Data Center (2004). "Event Record Details for Hardee, Highlands and Polk Counties". National Oceanic and Atmospheric Administration. Archived from the original on May 19, 2011. Retrieved October 13, 2007. ^ a b c d National Climatic Data Center (2004). "Event Record Details for Charlotte, De Soto, Lee, Manatee and Sarasota Counties". National Oceanic and Atmospheric Administration. Archived from the original on May 19, 2011. Retrieved October 13, 2007. ^ "FEMA: Help Flows To Areas Hardest Hit By Hurricane Charley". Archived from the original on October 31, 2007. Retrieved December 6, 2007. ^ National Climatic Data Center (2004). "Event Report for Hendry County". Archived from the original on May 20, 2011. Retrieved August 4, 2006. ^ a b Mark Linhares (2004). "Hurricane Charley Preliminary Storm Summary". Tampa Bay National Weather Service. Archived from the original on August 29, 2006. Retrieved August 4, 2006. ^ "Post-Tropical Cyclone Report—Hurricane Charley". National Weather Service, Melbourne office. August 20, 2004. Archived from the original on September 30, 2006. Retrieved July 19, 2008. ^ Matthew Hirsch (2004). "Hurricane Charley". National Weather Service. Archived from the original on October 16, 2008. Retrieved August 13, 2011. ^ Florida State Emergency Response Team (August 21, 2004). "Situation Report 27: Hurricane CHARLEY" (PDF). Retrieved October 10, 2007. ^ Florida State Emergency Response Team (August 26, 2004). "Situation Report 38: Hurricane CHARLEY" (PDF). Retrieved October 10, 2007. ^ Cnn.com (2005). "Mighty Heat, hunger, debris stress Floridians". Archived from the original on September 13, 2005. Retrieved June 8, 2006. ^ Shaila K. Dewan (August 21, 2004). "Hurricane CHARLEY: Education; Activities Slowly Resume in Schools Hit Hard by Storm". The New York Times. Retrieved October 10, 2007. ^ Laura Layden (August 14, 2005). "One year later: Growing optimism: Ag industry recovering". Naples Daily News. Retrieved April 26, 2011. ^ National Climatic Data Center (2004). "Event Report for South Carolina (2)". Archived from the original on May 20, 2011. Retrieved June 23, 2006. ^ National Climatic Data Center (2004). "Event Report for South Carolina (3)". Archived from the original on May 20, 2011. Retrieved June 23, 2006. ^ National Climatic Data Center (2004). "Event Report for North Carolina". Archived from the original on May 20, 2011. Retrieved June 23, 2006. ^ National Climatic Data Center (2004). "Event Report for North Carolina (2)". Archived from the original on May 20, 2011. Retrieved June 23, 2006. ^ National Climatic Data Center (2004). "Event Report for North Carolina (3)". Archived from the original on June 13, 2007. Retrieved June 23, 2006. ^ National Climatic Data Center (2004). "Virginia Event Report". Archived from the original on May 20, 2011. Retrieved June 23, 2006. ^ White House (August 15, 2004). "President Tours Hurricane Damage". Retrieved August 13, 2011. ^ "Floridians cope with hurricane's aftermath". CNN. August 17, 2004. Retrieved August 13, 2011. Wikimedia Commons has media related to Hurricane Charley.